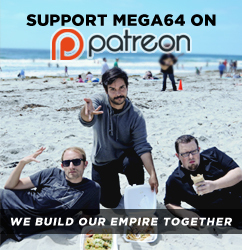 Next week, the Mega64 boyz (Oh, and Meg) will descend upon Seattle once again for PAX West 2018! We'll be at our booth all weekend long (Booth #7016 on the top floor, Floor 6!) with tons of great merch and exclusives. We'll be there and ready to hang with y'all, sign whatever, and just generally be cool Seattle badasses. Doesn't that sound GREAT? Anyway, our panel, "MEGA64 PANEL NOW FEATURING BATTLE ROYALE MODE" will be on Saturday, September 1 at 9:30PM in the Sasquatch Theater (Which is in the Sheraton next to the convention center!). Gonna show some new and secret stuff- definitely not one to miss! Today we debuted a brand new item debuting at our PAX booth! What a rad new hat for all you snapback lovers! On top of that, we've got all the big merch we've had at all the big summer cons.